This article is about the Attribute. For the Type, see Aqua. For the Alignment, see Water (Alignment). WATER (水（みず） Mizu) is a very versatile Attribute, and even has a semi-viable Deck based around such monsters, the Water Deck. The Monster Types typically associated with WATER are Aqua, Fish, and Sea Serpent, though Plants and Reptiles are not uncommonly WATER monsters. WATER is usually thought of as the opposite to FIRE, though there is no real advantage for either Attribute over each other in the OCG/TCG. Because of their versatility, Water monsters can be used in a number of strategic ways, possessing many different abilities. Some of the most powerful WATER monsters include: "Gogiga Gagagigo", "White Night Dragon", "Superancient Deepsea King Coelacanth", and "Ocean Dragon Lord - Neo-Daedalus". The general strategy for all WATER decks is to create a lockdown on the field for the opponent while building up and replenishing the player's resources. This makes most WATER Decks very passive, but that can be a good thing because WATER Decks need some set up time to work their combos correctly. But the most popular WATER Deck typically tries to boost the ATK of WATER monsters with "A Legendary Ocean" while simultaneously lowering their Levels with "A Legendary Ocean" to summon them faster, a very effective strategy when played correctly. One example is "Giga Gagagigo", a Level 5 Normal Reptile with 2450 ATK, which is strong enough to overpower Monarchs. In Stardust Overdrive, WATER monsters gained new support, such as draw support from "Moray of Greed". WATER is also the only Attribute not to contain any "LV" monsters. Archetypes include "Cloudian" (with the exception of "Cloudian - Eye of the Typhoon"), "Frog", "Ice Barrier", "Atlantean", "Mermail", "Gishki", "Nekroz", "Dinomist", and "Graydle". They have their own Structure Decks: Structure Deck: Fury from the Deep and Realm of the Sea Emperor Structure Deck/Structure Deck: Roar of the Sea Emperor. WATER Monsters are used by Mako Tsunami in Yu-Gi-Oh!, Admiral in Yu-Gi-Oh! GX, Shark and Rio in Yu-Gi-Oh! ZEXAL. "Mother Grizzly", a Deck Searcher for Water Monsters. "Star Boy", boosting the ATK strength of all Water monsters on the field by 500. "Warrior of Atlantis" is a 1900 ATK searcher for "A Legendary Ocean". "Skreech" can dump two WATER monsters from your deck to the graveyard, which then fulfills the summoning conditions for "Fenrir", or "Aqua Spirit". A card seen in almost every Water Deck is "Gravity Bind" or "Bubble Bringer", which will allow the player's Level 4 monsters to attack with "A Legendary Ocean" on the field, locking down the opponent. In a "Mermail" deck, you can discard it and "Mermail Abyssgunde" to send a "Mermail" to the Graveyard, and trigger the effect of "Abyssgunde" and Special Summon the "Mermail" you dumped. In an "Ice Barrier" deck, you can use its effect to dump an "Ice Barrier" to later Special Summon by the effect of "Prior of the Ice Barrier" or "General Gantala of the Ice Barrier". In a "Frog" deck, it can serve to dump monsters for cost to activate the effect of "Ronintoadin". Another good combo is using "A Legendary Ocean", "Tornado Wall", and "Astral Barrier". Attacks from your opponent become direct attacks because of "Astral Barrier" and "Tornado Wall" will make the direct damage 0. If you want to save this combo you can play "Imperial Custom", which will protect all your other continuous traps from being destroyed like your "Astral Barrier" and "Tornado Wall". Or you can play "Forgotten Temple of the Deep" which is also a Continuous Trap and is treated as "Umi", so it will be harder to ruin the combo because "Imperial Custom" will protect it as well. "Field Barrier" can also protect "Umi "and keep it on the Field. Numerous water decks rely on this field spell card to perform powerful effects as discussed below. Daedalus Method: One way to use A Legendary Ocean is with the Levia-Dragon - Daedalus or its superior, the Ocean Dragon Lord - Neo-Daedalus. Both monsters' effects require A Legendary Ocean or Umi to be activated. As a result, the entire field is destroyed except the Daedalus, leaving the user a clear field to perform direct attacks on the opponent. If Abyssal Kingshark is on the field when you activate Daedalus' effect, the Shark is not destroyed. Normally, people would prefer A Legendary Ocean for this operation in contrast to Umi. This is because summoning the Levia-Dragon - Daedalus would only require one Tribute. Others prefer to use the card Big Wave Small Wave to summon the Daedalus, which is a smart addition to Water Decks regarding these tactics. Another good idea is using Warrior of Atlantis to search out A Legendary Ocean. You could even use Terraforming. Decrease Monster Level Method 1: Another way to use A Legendary Ocean is to utilize its level decreasing ability on water monsters on the field and in the hand. Strong Level 5 water monsters such as Giga Gagagigo, Terrorking Salmon, Cyber Shark, or Catapult Turtle can then be normal summoned without a Tribute, allowing the user a more efficient way of bringing out monsters to inflict heavy damage. Decrease Monster Level Method 2: Another variation of this method utilizes stall cards such as Gravity Bind or Level Limit - Area B to halt monsters at or above Level 4. Since the user's water monsters (preferably monsters originally Level 4) are decreased in level, then those monsters would be able to escape the stall cards. This allows Mermaid Knight or Amphibious Bugroth MK-3 to either attack twice or attack directly. Field Barrier will help in protecting A Legendary Ocean. Spell and/or trap negation and/or removal will be handy as well including Dust Tornado, Mystical Space Typhoon, or Solemn Judgment. Synchro Methods: A Legendary Ocean Deck builds, to some extent, could also utilize Synchro Monsters. One of the latest support cards is Deep Sea Diva. Not only is this card a Tuner, but when Normal Summoned, it can bring out a Level 3 Sea Serpent from your Deck. Three examples would be Atlantean Pikeman, Mermaid Archer, and Spined Gillman. This could either bring about a Level 4 or a Level 5 Synchro Monster easily, unless a Level 2 or Level 3 Synchro Monster comes out. This should be used as a back up plan because A Legendary Ocean will downgrade these Water Monster's level making it more difficult to Summon the desired Synchro Monster. However, it is possible to also utilize this Field Spell Card to bring out the necessary Synchro Monster. In addition to that, Deep Sea Diva has less than 1500 ATK so it can be added back to your Hand by Salvage. However, Water Deck users must be aware of its low attack. A Monster with 200 ATK and 400 DEF cannot survive for very long. All in all, using these can be a great advantage since it can gives the user more options in a Duel. Alternatively, you can add in DNA Transplant to disrupt your opponent's Tuner monsters, as now all of their monsters will be reduced by 1 level, severely hampering their summoning efforts while leaving your monsters untouched. Moreover, using cards like Fishborg Blaster provides heavy support. A water deck is very versatile. It can lock your opponent down with the "Amphibious Bugroth MK-3"/"Mermaid Knight", Summon devastating beatsticks such as the "Giga Gagagigo" or "Terrorking Salmon" or control the field with "Levia-Dragon - Daedalus". Basically, it revolves many methods to win the opponent and all of them can be put into the deck. In most cases, they also have good stalling ability with support such as "Gravity Bind" and "Level Limit - Area B". They also have good defense cards to such as "Mother Grizzly", "Penguin Soldier" and "Nightmare Penguin". Not only do these card protect you from monster attacks, but either ruin your opponent's offensive or give you card advantage. Another combo is "Dupe Frog" and "Flip Flop Frog"; "Dupe Frog" has 2000 DEF, and can only be be selected as an attack target by your opponent, which could create a lock when multiples of "Dupe Frog" are on the field. Moreover, when "Dupe Frog" is destroyed, you can search your deck or graveyard to add another "Frog" monster. When used with "Flip Flop Frog", you can clear your opponent's monster cards. With the advent of new WATER-based support in Ancient Prophecy, "A Legendary Ocean" Decks have gained more power. 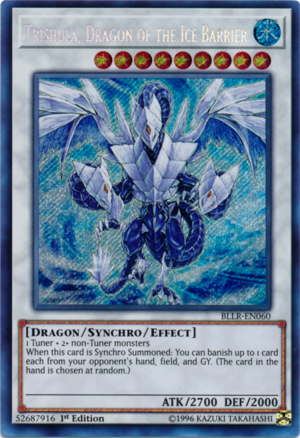 Destroyed field cards can be replenished with "Divine Dragon Aquabizarre", while various new monsters have been made to take advantage of the level-reducing effect of "A Legendary Ocean" (such has requiring a level 3 or lower WATER type monster to be present on the field to activate their effects). "Aegis of the Ocean Dragon Lord" is one such card, and can turn into an OTK when used with its namesake, "Ocean Dragon Lord - Neo-Daedalus". In addition "Shark Cruiser" is a Level 5 Monster which, when destroyed by an opponent's card effect, search two Level 4 or lower WATER Monsters from your deck. In Absolute Powerforce, the card "Codarus" added a much needed boost to this Deck, acting as a mini "Levia-Dragon - Daedalus" which sends cards to the graveyard instead of destroying them, able to bypass the effects of "Stardust Dragon" and "Starlight Road". Also, "Forgotten Temple of the Deep" acts as a Trap Card "Umi", giving this deck more options. One weakness of Water Decks and Water monsters in general, is that they rely on "Umi" or "A Legendary Ocean" to work to their potential. This will also make it much harder to duel an opponent who also uses water monsters since the field power bonus from Umi or A Legendary Ocean applies to their water monsters too. They lack cards that allow them more draw power, while using much of their hand up. Some of their effects are also rather passive compared to other Attributes, such as FIRE's aggression and EARTH's reliable defensive tactics. All in all, though, a well-prepared Water Deck can be an extremely difficult obstacle to overcome. This page was last edited on 4 April 2018, at 00:52.